Because of the outcome of the voting for our wonderful mom contest, i have decided to stop the contest but just as I promise, I am still be giving treats for our Wonderful Moms. Being a woman, we wanted to look our best and be beautiful at all times but sometimes it's really hard to stay that way. I am not blessed with beautiful skin and sometimes i do envy those women who have beautiful white skin but i have learned to accept what I have especially when I have learned that there are many ways to achieve fair and beautiful skin. As a mother, we often took for granted our self especially our skin, our family is always our first priority but we must also remember that we must not forget to take care of our self, stay fit and look good not just for our own benefit but also for the benefit of our family. You really don't want to look 10 years older on your own age. LOL. Lately, i have been having this big pimples all over my face leaving black marks , it is because i have been addicted to facebook and working with my sites and it really alarms me because when i was still in my teens, i have never experience more than two pimples in a period of one year but as we go older (accept the fact) our skin tends to break more thus we have to be more diligent in taking care of our skin and not to forget to clean them before we go to sleep to remove those dirt especially if your a working mom. 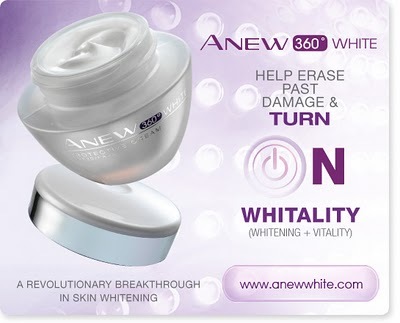 Now, I learned about this new product from Avon's Anew 360 White that can help my skin erase past damage and will eventually make my skin more whiter and smoother and I wanted to share them with my beloved readers. FOR PHILIPPINE RESIDENTS ONLY, For our international friends, don't worry I am thinking another contest for all of you. 1. You must be a follower of this site. Click our follow button via Google Connect. 2. Tell us how you take care of your skin. 1 valid comment = 1 entry - You can comment as many times as you want! BUT TAKE NOTE, only on topic and sensible comments will only be counted. 5. Share this contest on your facebook wall, blog or twitter (make sure to tag us @Babiesandcontests for facebook , @melandriaromero for twitter or on your blog post and link this page - Copy the URL and post it here. 1 entry for tweet, facebook shoutout or blog post. 6. Post your answer and the topic url where you post your comment in this post. Make sure you provide us with your valid email in the comment form just below your name. 7. We will be making the draw via manual drawing and the video will be posted here! Contest start on May 15, 2010 - June 15, 2010. Join Now , invite your friends and stay beautiful! Do visit our site time to time because I am thinking of giving a giveaway monthly. * This contest is not sponsored by Avon! i love this product, i will definitely join! count me in sis! I will join this contest because the prize is what I am currently using, lol.. That will be a lot of savings for me, hahaha..
Will be back for my entry.. I am off to bed after this comment.. Thanks for dropping by my blog and wishing me well. :) I would love to join this contest, because we do have the same issues when it comes to our facial skin. I'll send feedback once I get all the instructions done. I wash my face with fragrance-free and hypoallergenic soap before i got to bed. My kids love to touch my face especially my eldest, who is blind and has GDD. Everytime he touches my face, he will say MOM. That is why I make sure that my skin is always smooth and pimple-free. Thanks for dropping by my blog and for the invitation to your contest. Yes I'll be joining.I'll let you know once I'm done the requirements. Good luck to your give-away. thanks for inviting me.. I'll be joining the contest.. Please feel free to inform me of your promos/ contests in the future so I can also share it with my readers. Thanks and more power! "How do you take care of your skin?" I take care of my skin by drinking 8 glasses, eating nutritious food, putting on sunblock and washing my face regularly in the morning and evening. My daily beauty regimen is very simple.I wash my face twice a day with nivea deep pore cleansing foam, in the morning I put sunblock gel on my face and at night I put anti-acne cream, plus I also take vitamin C, squibb vitamin E and a glass of milk. 2. I take good care of my skin by following the three basic rules in skin care: cleanse, tones & moisturize. "I take real good care of my skin 'coz now I'm on my thirties, and wrinkles may start to appear. Though I suggest one can never be too young nor too old to start the basic skin care regimen. I still stick to the basics, and that is: 1) cleanse your face with a mild soap or any water-based facial wash, 2) remove dirt residues with a mild toner, and 3) moisturize your face with moisturizer suitable to your skin type. It would also helps a lot to put on sunscreen daily (yup, even when your indoors, 'coz radiation & UV rays from lights, lamps & bulbs also harms the skin)& to drink plenty of water especially on summer days..."
drink a lot of water, cleans 3x a day, apply sunblock and at night cleans, tone and moisturized. Followed you via Google Connect. Hello everyone, if your entering my giveaway using face book shout out, please do leave a valid email address so that i can contact you in case you win, thanks. Im already your avid follower here. I have a dry skin that's why I always make it sure to use moisturizing lotion everyday. Drink lots of water is also my secret on how I take care of my skin. I had commented on your other blog, Something to Live by on your Follow me back Tuesday post. I always wash my face twice a day with a facial wash then use a toner because i have an oily skin and some acne breakouts. I also moisturize or use tinted facial lotion. for the morning, i use sunblock to protect my face on the extreme harmful rays of the sun. thanks to all, keep those comments coming. i took care of my skin by eating(fruits and veggies) and living healthy. Drinking 8 glasses of water everyday, enough sleep and using the right moisturizer and lotion. 2. I don't apply soap or any facial wash on my face just plain water :) i eat a lot of fruits and vegetables to keep my skin young and fresh..
That's it i guess! :) please enter me, thanks..
wow ganda naman nito kaya lang wala akong time sis, anyway, I will be checking again...and will be visiting you. 2. BEAUTY TIP: since its summer and sun do damage our hair too! what i do for my hair is that i beat two eggs mixed with some milk and run throughout my hair, im really doing this once a month since summer began. because its our crowning glory so let's not take our hair for granted. and since im in my mid 30's so wrinkles are slowly showing, what i do is i mash 1/4 banana until very creamy. Spread all over my face and leave it for 15-20 minutes before rinsing off with warm water. sometimes i used ice cubes and gently massage onto my face. its so relaxing. we had a great time, did a LOT of walking, and got some fun stories to bring back, like the margaritas and "free" comedy show! I absolutely love this product. I am addicted to using it. Avon has always been a favorite of mine. I used to be an Avon consultant but it work out. However, now I am working at my own home business making party favors and I love it! Plus, I am earning a substantial income as well. Anyway, thanks for the visits. I hope you leave your link so I can return your visits. This contest is officially closed. Watch out for the announcement of winner.